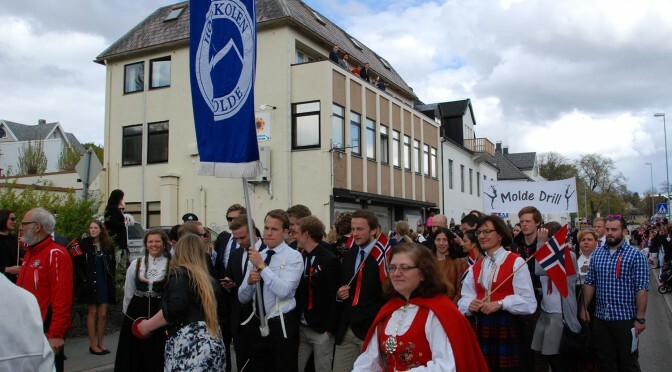 Himolde students in the 17. of May parade led by Simen Strøm Nordnes. The real amount of population of Molde was finally shown on the 17th of May- The Norwegian Constitution Day. The streets, normally so scarcely populated, were suddenly lined up with a crowd, on both sides of the road, chanting, waving flags or just enjoying the parade. For students of HiMolde the celebration started at 13:00 in the cafeteria of Himolde and for some even earlier on famous traditional champagne breakfasts. The unusual sight of full cafeteria on Sunday was decorated by female students wearing national costumes worth tens thousands of Norwegian crowns. The Constitution Day has a deep meaning for Norwegian citizens. The decorative Norwegian national costume, called Bunad, truly is beautiful. Said Kjell Arne Bergli, a student of HiMolde. In the speech given by the Rector of HimMlde Hallgeir Gammelsæter he congratulated all the students and remembered the important 70. anniversary of the end of the Second World War during which Norway lost its independence for a short period of time. He also reminded everyone that Norwegian Constitution Day is not just a celebration for the Norwegian freedom but a celebration of human rights everywhere. It was a very nice gesture towards many International students who attended the event as well. Claimed Anatole Ansar, International student from France. Anatole Ansar participating in the parade. The main organizer of the event Simen Strøm Nordnes said that he welcomes all the International students and that he encourages them to celebrate their habits by bringing national costumes and even flags, despite the ongoing discussion in the society about this topic. After attendees enjoyed the cake and other refreshments the crowd took off into the city. Few joined the traditional parade, starting at high school and finishing at the city hall, the rest went to enjoy their own personal celebrations. For more photos from 17th of May celebration visit our Facebook page.